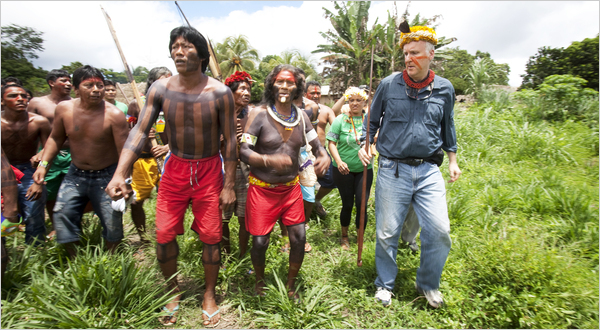 This encounter was bound to happen: Hollywood movie director James Cameron, creator of the blockbuster movie Avatar, meets a group of indigenous tribes in the Brazilian Amazon. But this wasn’t part of a movie plot or promotional stunt: Cameron took time off to make his first ever visit to the Amazon because of a real world environmental cause. 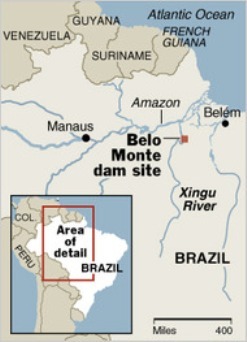 The dam is a “quintessential example of the type of thing we are showing in ‘Avatar’ — the collision of a technological civilization’s vision for progress at the expense of the natural world and the cultures of the indigenous people that live there,” the newspaper quotes Cameron as saying. Cameron had derived inspiration from decades long struggles to save the Amazon, but he didn’t know of this specific project until recently. Apparently he first became aware of the issue in February 2010, when he was presented with a letter from advocacy organizations and Native American groups saying they wanted Mr. Cameron to highlight “the real Pandoras in the world”. And now, within weeks, the Avatar-maker and Amazon-savers have joined hands! See also October 2009 blog post: Adrian Cowell and ‘The Decade of Destruction’: A film can make a difference! Sorry to hear that even the formidable Cameron power did not work and the project has been apporoved to go ahead. That was not a very nice Earth Day message from Brazil. « Sri Lanka General Election 2010: Voting for the ‘Undiscovered Country’?